Today's story is from our friend Holger Nils Pohl. 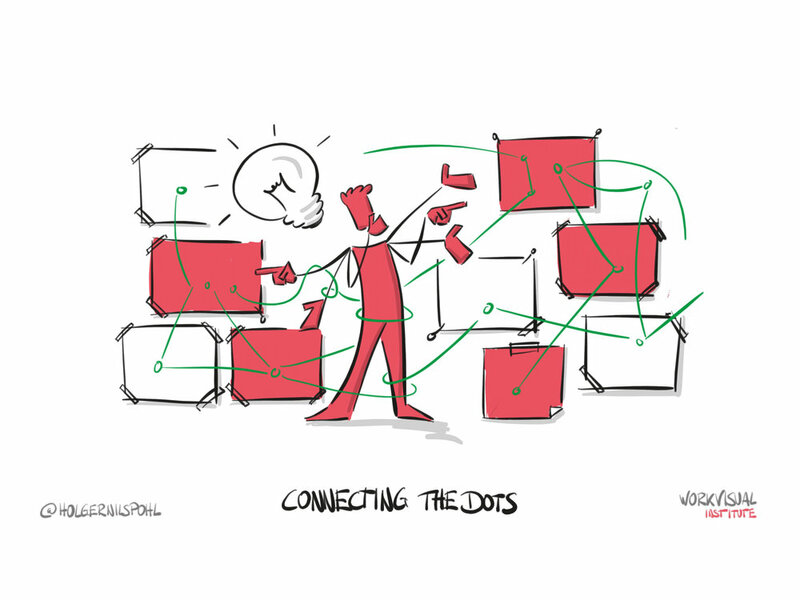 We worked with Holger during the World Sketchnote Day 2016 and we spent some time chatting and sharing about sketchnotes, visual thinking, and apps: Holger has a lot to say and I'm pretty sure you'll love this story. I officially called myself a Visual Practitioner in 2010 for the first time. Actually, I've been one for all my life, as I found out later. So let's start with the beginning of my journey. Drawing was always my passion. It's the way I can express myself best and it's the best way to talk to myself without other people looking at me like I was crazy. 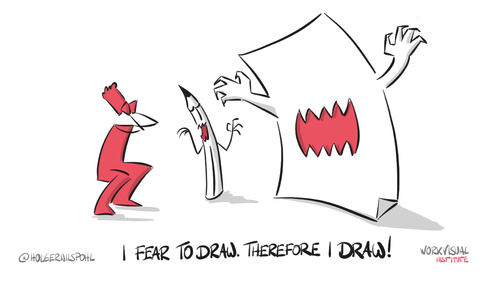 Drawing is the conversation with my own brain – or the brain of others. As a child and adolescent I did it all: Tracing and copying my favorite comic artists, experimenting, creating whole new universes on an A4 sheet of paper, and so on. In school I tried to build in as many graphics and drawings in my homework as I could (which often led to hours of doing homework though…). And around 10th grade something happened to my way of working. It became kind of "solution oriented". I learned by drawing out the connections between different topics at school. Like unprofessional mind maps if you want. The highlight was my "learning map" for the final degree in biology. I taped 9 A2 sheets of paper together and connected all the content with each other on this hugh, absolute messy looking map. What it did for me was that I could recall the content by virtually following the connections in my memory of the map. That helped. But ever since the 10th grade I struggled with my drawing style and technique and capabilities. I still loved to draw and paint – the smell of a fresh oil painting while cleaning your brushes with turpentine... that's the smell of heaven. The itch in the back of my neck rejected to go away. I had to force myself to continue to draw. Hard time. I'm still struggling everyday with it till today actually. In my urge to draw while not actually drawing, I started to teach future students how to draw. That was during my time at the university for applied science studying Architecture. Which I ended after 3 semesters to become a carpenter. There is a distinct connection between drawing and creating something out of wood, you know? It's this moment of concentration to get the perfect line, the perfect surface while working with something organically like wood, like your own hands. It was one of my best life decisions to learn this craft. I still taught drawing while getting my diploma in communication design which I studied directly after the apprenticeship. All in all straight forward into my first jobs as a self-employed designer at the age of 29. I knew I was good at design and even better when I was "with people". That's a pattern that stayed with me since ever actually. Planning? Organizing? Working structured? Uhh…but being there, being in the moment and creating a connection to the humans I'm interacting with? That's easy. My strength. Naturally when I stumbled upon "Graphic Recording" in 2010 I felt it right away: "That's my thing!" And you know why? Of course because it's a job that is strongly connected to people. But even better it forces me to draw. There is no way out! The perfect technique to overcome my resistance (like Steven Pressfields "Resistance") when it comes to drawing! And it was so much fun. Really. Listening to people speaking and drawing the big pictures, the connecting dots and the underlying themes and topics is really fun. It's not easy for sure. That makes it even better though. Capturing all that knowledge, all that thinking on paper felt good. I worked on all the formats and sizes from tiny, tiny A5 cards up to 12 and even 20 square meters of paper. But there is one thing I need to explain about "my style" to visualize. 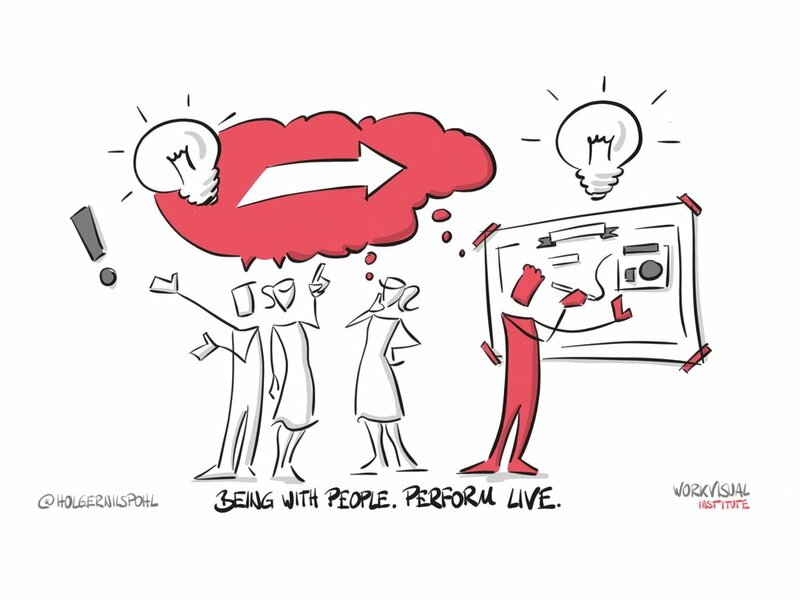 Call it Graphic Recording, Visual Facilitation or Sketchnoting – it's all kind of the same for me. And there are two rules I follow very strictly. 1. I'm finished when the speaker/discussion/workshop is finished. There is no editing when the show is over. I start with a blank piece of paper and I end when they end. 2. I do all I can to capture the essence and the core of the concepts, ideas and topics the people are talking about. It's all about THEIR content. If they don't joke, I won't joke in my pictures. If they are serious, I'm serious. I service them and their content. I don't service a wonderful, colorful picture. Within these two rules lies something that led me to work on the iPad more and more over the years. As conference hosts and workshop moderators and consultants developing new styles of working on conferences, workshops and meetings they changed the formats. It's nowadays more about break out groups, peer to peer discussions, mentorings etc. and less about keynote speak x, then keynote speak y, blah blah blah. So tell me, how can I be finished with my work, when they are finished with their group works when I have to take notes in every group, then get back to my paper on the wall and back to the group and so forth? You could do it with smaller cardboard what I do often. That makes you more mobile. But it stays small afterwards too… That's where the iPad enters the game. With the iPad wireless connected to a projector or to multiple screens in the different rooms combines it all. I'm super flexible and mobile plus I'm able to show my work on really big formats at the wall. Game changing! At least for me. Especially if you see my second rule: "It's about the essence and its about their content." More often than not the content is only slightly connected. In my experience every 20 to 40 minutes there is a small (sometimes a big) shift in the current hot topic of the workshop. Therefore I shift my "metaphor" or "drawing principle" or "core picture" every 20 to 40 minutes as well. And one iPad screen seems to be perfectly holding roughly 20 to 40 minutes of content in the size and grade of detail I work. What a wonderful fit! And the iPad does something powerful to me as well. All of sudden I have near to no barrier to the people in the workshop, meeting or conference. There is no bulky cardboard between us. There is no colorful marker that could ruin their business cloths when I come to near to them. There is just a "small" device that beams like magic their spoken words in a visual way to the wall – and all of that while they can chat to me like I was just one of them. Think about that. Think of the power in the relationship to the people that arises from this shift. It meant the world at least to me! I found my preferred iPad App quite quickly after having seen Rachel Smith on youtube talking about the App called "Brushes " (the brown version). It became my go to App for the next 986 pictures I created on the iPad while providing Visual Facilitation. It even let me create videos of my drawing flow. It was just wonderful! And all of a sudden this version stopped being updated…a small shock for me. Which became even worse when the new version didn't work at all like I needed it to work. Horror! And even worse the new version was set on hold as well…that was like 3.5 years ago. I did like 40% of my jobs with that App on the iPad. And I hoped someone would come up with a solution. Perhaps with a new app (the other existing apps didn't work for my special use case) or something like that. But nothing happened. No one moved. And I was deadly scared updating my iPad to a new iOS version in the fear of loosing my biggest asset to work with. Long story short – I couldn’t bear the pressure and fear any longer and spoke to my coding friends at rausgegangen. Luckily they saw the fun in developing a drawing app. I spent all the time I could personally afford in the concept of an app that would suit my needs perfectly. Doing live visualization on the iPad, being super quick and projecting super big and possibly free of distraction. With my colleagues and team at the nowadays called WorkVisual Institute, with my friends at rausgegangen and a lovely community of visual practitioners around the world I managed to bring the WorkVisual App to life. But this story is not about the App. It's about my journey, right? And the App is just another milestone on that journey. It helps me to think deeply about my own workflows. It helps me to connect to wonderful people out there (feel hugged!). And it helps me personally to grow. Growing in a sense that I have created a tool basically for me that helps me (again) overcome my resistance to draw by making it fun to draw – because it’s my tool! If it wouldn't be so costly in terms of time and money I would even say everybody should build his own tool to draw. It adds a new dimension to your work which is deep, thankful and energetic. Yes, it slowed me down. Yes, the team is still small and could be bigger already without the app. But you should see the six of us discovering something we can do with the app that we weren't aware of before. Six small boys are sitting around their toy fully absorbed and within another fictional universe. And on those hard days that come from time to time I try to imagine some other visual fellows feeling something similar while drawing out the world. or Facebook Holger Nils Pohl or any of those other networks out there. ... It was one of my best decisions in my life to learn this craftsmanship. ... It's all about THEIR content. Think about that. Think of the power in the relationship to the people that arises from this shift. It meant the world at least to me! Thank you so much for sharing your story with us, Holger.